Sgt. Justin Longoria (L) and Sgt. Jermaine Spencer (R) at a Roscoe Village Toys "R" Us store help kick off the annual holiday toy drive to benefit the Marine Toys for Tots Foundation. The United States' Marine Corps. annual drive to collect toys for those less fortunate has kicked off for the 2012 holiday season. Sgt. Jermaine Spencer and Sgt. Justin Longoria were stationed at a Toys "R" Us store in Chicago's Roscoe Village on Friday morning to raise awareness for the campaign and collected donated toys. "As of right now, Toys R Us is the main one that started. It's pretty early in the season, so this is our first main one," said Longoria. New, unwrapped toys can be donated at Toys "R" Us stores through late December. Cashiers will also take monetary donations, Spencer explained. Program coordinators will then collect the toys in central warehouses where they are sorted by age and gender before being sent to social welfare agencies, church groups, and other community agencies for distribution. 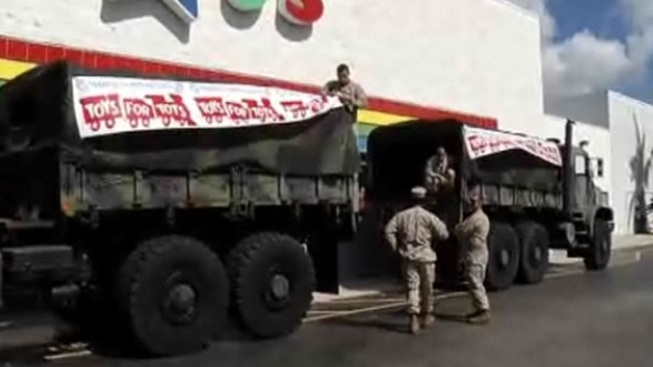 Visit ToysForTots.org to learn more about the organization and to find a drop-off location.